More than 400 acres of crops have been destroyed by the IDF near the fence surrounding Gaza, in a lethal no-go zone maintained unilaterally by Israel on the Palestinian side of the border. They say they sprayed pesticides to enable a security operation. The no-go area is volatile and many explosives are found in it. The IDF told RT this was such a case, as it continues to patrol the area for improvised explosive devices (IEDs) and signs of border infiltrations. Israel’s ground forces have also been regularly entering the Gaza Strip to clear obstructions and for other purposes. 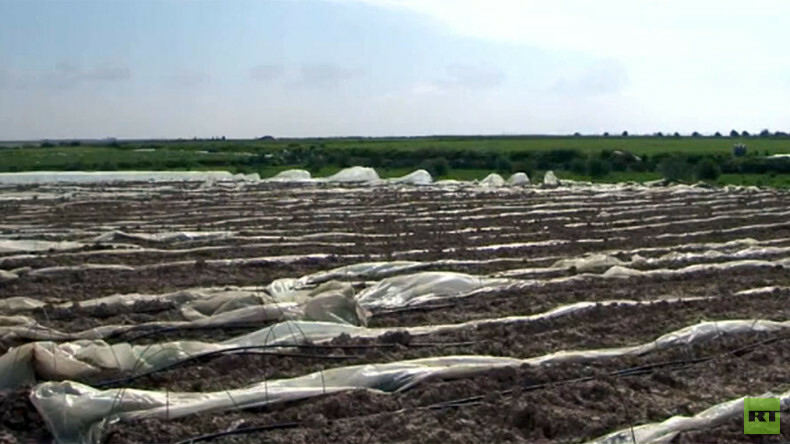 The IDF added the spraying of the pesticides did not harm the environment, but Palestinian farmers say hundreds of acres have been laid to waste, and showed evidence of this. “A catastrophe took place here. A farmer works to make a living for his family. The IDF sprayed the crops. I wonder who will take responsibility for these actions. No one thinks of us. The proof is here. Come and take a look. All of our crops are damaged. They are no good for humans, or even animals,” Azam Said Abo Abed said. Another, Salam Muhana, said he worries the IDF will spray the crops again, if they are replanted. The farmers are now picking what little crops have not been damaged. Asked whether they believe the IDF is employing some sort of tactic here, the farmers said they didn’t know, and some choose to blame the Ministry of Agriculture, which had not kept in touch or asked them about the damage. By contrast, they say, the Red Cross showed up to repair the area the last time. They are now appealing to the government, the Ministry of Agriculture and the Red Cross – particularly the latter, who last time sent specialists to take samples of the crops and survey the farms. The IDF has maintained a no-go buffer zone around the Gaza border for years. Many have been killed and wounded there, as Israel attempts to defend the area near the fence from angry demonstrators. However, farmers and scrap collectors also end up being targets.